The census was taken on 31 March. There were 318 residents in Preston - 141 males and 179 females. They included 51couples and 20 widows or widowers. They occupied 62 cottages, an average of 4.4 inhabitants in each home. There were 7 farmhouses and two additional properties: ‘The Laburnums’ (now ‘Pryor House’) and ‘The Cottage’ (‘The Dower House’). Two houses were unoccupied. 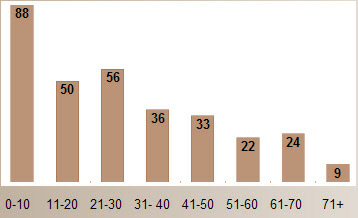 One hundred and thirty-seven of the villagers (43%) were aged under 21 years. The youngest was three-month-old George Jeeves from Castle Farm lodge and the oldest was the widow, Mary Bushell, 80. Of the 286 surviving villagers from 1891, 155 (54%) were still living in Preston ten years ten years later. Forty-four moved within a five-mile radius of the village. Another 17 remained in Hertfordshire and 22 left the county. Seven relocated in Hitchin and six moved to London. That Preston was a desirable place to live in 1901 is shown by the occupation at ‘The Cottage’ of Henry Anstruther, Lord of the Treasury. Communication with the outside world was improved by the appointment of a telegraph clerk and a postal messenger. Link to transcription of 1901 Preston census.